This article was first published on Foreign Affairs. No figure in Iranian President Hassan Rouhani’s tightknit cabinet was more lifted by the recent Iranian election results than Oil Minister Bijan Zangeneh. The Iranian economy hangs on his ability to deliver on his ambitious plans to attract $200 billion in foreign investment to expand Iran’s enormous oil and gas export potential. Following the election, which saw allies of Rouhani gain ground, Zangeneh has a freer hand to push ahead with this agenda. Still, Zangeneh’s job won’t be easy. His ability to succeed depends on his capacity to take into consideration his rivals’ key interests, particularly those of companies linked to the powerful Islamic Revolution Guards Corps (IRGC). And on that score, although Zangeneh has vowed to be accommodating of IRGC interests, there is huge uncertainty on whether he can succeed on this critical test. Hardliners have been particularly critical of Zangeneh since Rouhani returned him to government in August 2013. The loudest voices, which came from the Majlis and media outlets close to the IRGC, claimed that he runs the Oil Ministry as his personal fiefdom. They also criticize Zangeneh for surrounding himself with a select group of men with whom he has worked since the 1980s, which, they claim, has made him unresponsive to criticism and too forgiving of his close lieutenants’ wrongdoings. Such criticisms were ramped up in the weeks before the elections, and as international sanctions on Iran were lifted. Calling Zangeneh the head of Iran’s “oil-mafia,” hardliners leveled damning charges of nepotism against members of the oil minister’s inner circle. His brainchild, the Iran Petroleum Contract (IPC), which was approved by the cabinet in October 2015 and is designed to entice foreign investors, was particularly attacked as a national sell-out. Heading into the election, the Zangeneh team doubled-down on countering charges of corruption and reinforcing the need for attracting foreign investment and energy policy reform at home. The Zangeneh team opted to keep its messaging simple. Accusations of corruption were either ignored or dismissed as political theatrics and without merit. Meanwhile, attracting foreign investment and technical know-how, they insisted, would be the only way for Iran to fulfill its potential in the oil, gas, and petrochemical sectors. This is a line that Rouhani firmly backs. Foreign investment is the “best way” to boost the economy, the president said in January, reminding the critics of the government that “domestic demand cannot solely push the economy toward eight percent growth” per year, which is the regime’s aim. In today’s political climate in Tehran, the question of foreign investment has become Rouhani’s litmus test and Zangeneh is one of his principal chamberlains. In the end, the campaign against Zangeneh didn’t stick. Following the first round of voting, of the 24 parliamentary members who had been on the energy commission, only one won reelection. His loudest critic, Massoud Mir-Kazemi, a former oil minister under President Mahmoud Ahmadinejad and a member of the outgoing energy commission, lost his parliamentary seat. Most of the new members are somewhere within the moderate side of Iranian politics. Now Zangeneh and his allies can look forward to a less hostile parliament. Zangeneh is known as the “Sheikh of Ministers” for his long track record in successive governments dating back to 1983. He has become synonymous with the reformist opposition movement and was a top advisor to Mir-Hossein Mousavi, the head of the Green opposition movement, in the violently disputed 2009 presidential elections. When Rouhani nominated Zangeneh as oil minister in 2013, hardliners in the parliament vowed to block his appointment. The opposition had less to do with his reformist sympathies than with fears that his reorganization of the ministry and plans to bring in foreign players would undercut local firms, which are often under the control of the IRGC-run conglomerate, Khatam ol-Anbia. These firms had expanded rapidly during the harshest years of sanctions under Ahmadinejad, when Iran’s access to foreign investment, technological expertise, and markets nosedived. Iran has the world’s largest natural gas reserves and the fourth largest oil reserves, and the IRGC’s economic stakes in both sectors are still significant. Zangeneh’s predecessor, Ghassem Rostami, was a former IRGC general who had no industry experience at the time of his appointment. He was part of a faction that Ahmadinejad brought in starting in 2005 with the aim of replacing, to the extent possible, the old so-called technocratic elite. This group resents being sidelined by Zangeneh and, under the guise of promoting Iranian energy know-how, has pushed to retain local firms as the principal players in the sector. 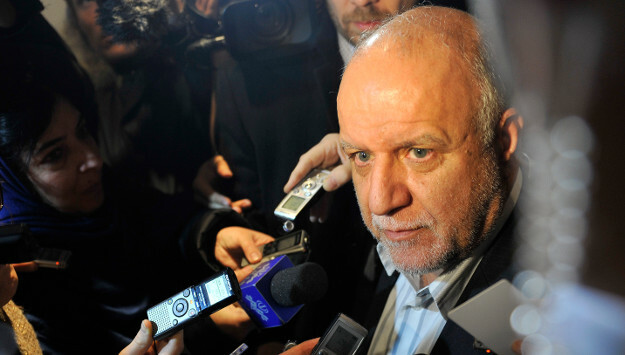 For the sake of political expediency, Zangeneh has to play a cautious game. He has repeatedly sought to publicly assure the IRGC generals that they will not be cut out of upcoming oil and gas projects, promising to find formulas in which foreign investors and IRGC-tied local companies can co-exist while together lifting Iranian oil, gas, and petrochemical production and revenue. Still, such assurances have yet to appease his rivals. In early March, while visiting South Pars, Iran’s largest natural gas project, IRGC boss General Mohammad Ali Jafari was explicit in insisting that Khatam-ol Anbia needs to be a key stakeholder in Iran’s energy future. To counter accusations that foreign investment would come at the expense of local companies, Zangeneh has argued that indigenizing all production is an archaic policy in an economically interdependent world and that Tehran ought to look for ways to supplement local production capabilities with foreign know-how and financing. Going it alone, at all times and on every front, makes no commercial sense. The numerous delays in developing the South Pars project is, he would stress, a case in point. Given the political atmosphere in Tehran, where hardliners from IRGC and elsewhere are waiting for the Rouhani government to stumble, Zangeneh will continue to wrap his plans and policy arguments in nationalistic terms. As he puts it, the participation by foreign, including U.S. energy firms, will help Iran secure better deals from a more diverse pool of investors. Zangeneh’s team is focused on two key talking points. First, that the new IPC will make it harder for foreign energy firms to abandon Iran in the event of future political tensions between Tehran and the international community. Second, that the IPC will, under most circumstances, force international oil and gas companies to find local Iranian firms as joint project partners. Both points directly relate to Supreme Leader Ayatollah Ali Khamenei’s express wish to see Iran become more economically independent. Such arguments might mollify the IRGC if its revenue stream is not too negatively affected by the arrival of foreign firms. But it will not be easy for Zangeneh to pull off and will most likely require plenty of restructuring on the part of the IRGC and its conglomerate, Khatam ol-Anbia. The biggest hurdle to overcome is to convince foreign investors that dealing with local firms in Iran will not put them in danger of breaking the many U.S. sanctions that remain on IRGC and many of its subsidiaries, and which were not part of the July 2015 nuclear deal. The quickest fix might be to break up such subsidiaries and overhaul the management chain to evade the IRGC’s footprint. But whether the IRGC bosses would agree to such a path is unknown. For now, though, Zangeneh has a hard time convincing IRGC-affiliated companies of his intentions. In other words, even with a new parliament in place, some backlash against the IPC will continue. As one of Rouhani’s key generals in the cabinet and as head of such a high-profile ministry, Zangeneh will bear the brunt of the attacks. And yet, support for Zangeneh from the presidential palace will help the country stay the course as it streamlines the oil and gas bureaucracy in the post-sanctions era. Whether Zangeneh will find win–win formulas to appease the IRGC while inviting foreign firms remains to be seen. And if he doesn’t, the Iranian energy sector, with its enormous potential for growth, will face a slow forward limp, making some progress, but no doubt falling behind its closest competitors among oil and gas exporters, just as it did in the last decade.